Principal Cast : Thomas Jane, Dylan Schmidt, Molly Parker, Neal McDonough, Kaitlyn Bernard, Brian d’Arcy James. Synopsis: A simple yet proud farmer in the year 1922 conspires to murder his wife for financial gain, convincing his teenage son to participate. 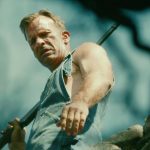 2017’s banner year for Stephen King continues with 1922, a Netflix-produced horror thriller set in pre-Depression era America and boasting a remarkably chameleonic performance by Thomas Jane, as central villain Wilfred James. While The Dark Tower was a bit of a debacle, 1922, along with Gerald’s Game and IT saw considerable acclaim in their respective markets. 1922’s murderous concept comes from King’s novella of the same name, published in 2010, and it’s a classic story of envy, greed and deception, followed by guilt and rising fear. It’s the kind of story (and film) that might make an intriguing stage production; it’s relatively light on extra characters, pivots around a single setting, and is driven by character rather than external machinations. In short, 1922 delivers a tense, often terrifying tearing up of the family unit at a time when America was tearing apart as well. 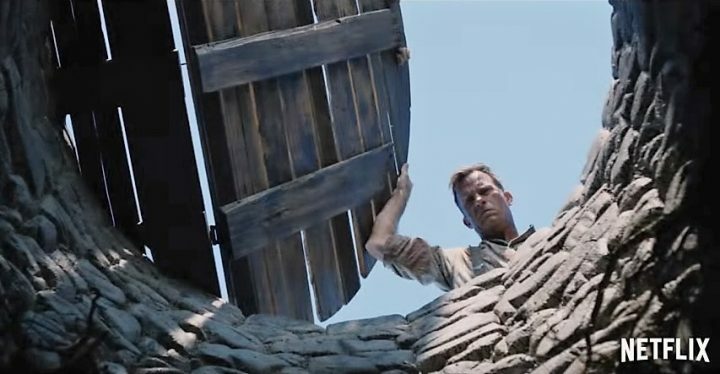 Told in flashback, Wilfred James (Thomas Jane) is a proud farmer living with his son Henry (Dylan Schmidt) and estranged wife Arlette (Molly Parker) on their corn farm in Nebraska. Arlette has recently inherited some land, and wants to sell and move to the city, while Wil wants to buy the property (at lesser value) and remain where they are. This conflict has caused a significant rift between Wil and Arlette, so much so that Wil conspires to kill her, and bury her body at the bottom of their farm’s well. Wil uses Henry’s love for Shannon Cotterie (Kaitlyn Bernard) against him in order to get him to assist. Not long after they’ve buried Arlette beneath the well, things take a sinister, supernatural turn, and Wilfred comes to believe that while his wife may be physically gone, her spirit continues to haunt them, driving him further into madness. 1922 runs with the conceit that a man driven by desperation commits a heinous crime and then spends the majority of the film trying to cover it up and get away with it. It’s an elegantly simple premise, and thanks to Zak Hilditch’s superb direction, is told with panache and a degree of flair one doesn’t expect for such an insular narrative. It’s something of an irony that the best post-modern King film adaptations are derived from his shorter novella writing; Shawshank Redemption and The Green Mile come immediately to mind as the most memorable, although it’s a surety that 1922 will become one of those oft-quoted classics of the writer’s filmography in years to come. 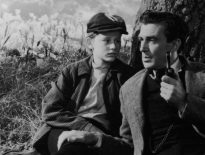 The screenplay is adapted from King’s work by the director, and he imbues the sun-roasted corn-fed rural lifestyle with a sense of menace, an inhospitably with the land that transfigures across to the people on it. The film draws most of its strength from the lead performance of Thomas Jane, who absolutely changes his entire persona with a startling performance that’s as effective as it is astonishing. His clench-jawed delivery, sweaty-brow solidity and quiet calm is a first-class acting job, from an actor who has sunk deep into the role and hides behind the deft writing of Hildich; I’ve normally found Jane an actor of limited ability to inhabit a character well, a little like Aaron Eckhart, but here he absolutely nails it. He’s ably supported by Dylan Schmidt as Henry, Wilfred’s teenage son, and the young actor more than holds up under the film’s limited-roster focus. 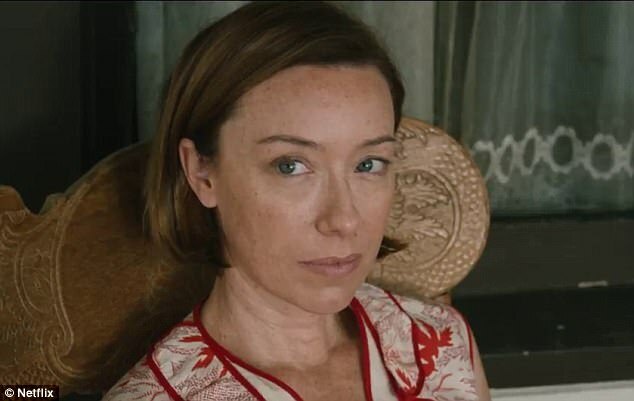 Molly Parker’s short-lived turn as Arlette is quite ferocious given her limited screen time, while the addition of Neal McDonough as Wilfred’s neighbour, and Kaitlyn Bernard, as Henry’s love-interest, add spice to the “will they get away with it” tension of the film’s latter half. Whether it be a role large or small, everyone is on their A-game here and the film is the better for it. Further to the film’s casting is the production design itself, which is really rather magnificent. 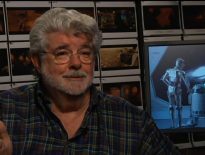 Shot with digital cameras but graded to represent that orange-hued, dusky pastoral quality older folks reminisce about, 1922 looks amazing. DP Ben Richardson (Beasts Of The Southern Wild, Wind River) gives the film a crisp immediacy loaded with style, and coupled with Merlin Eden’s editing, make this film a razor-wire epic of ratcheting tension amidst glorious widescreen photography. The film’s moments of abject horror – Arlette’s murder, the later-stages grisly gore – are shockingly brutal against the clean, crisp dramatic moments, and it’s this startling visual difference that elevates the violence of the film into a more pure sense of horror, rather than modern jump-scare trickery. Mike Patton’s tingly, skin-prickle musical score is subtle, engaging and suits the slow-burn storytelling method Hilditch employs so well, with screechy strings and bass-driven atmospherics intertwined to wedge the evil within 1922’s narrative right into your fear center. I was really rather impressed with 1922, although I certainly don’t mean to sound condescending. For such a simple story to be told with such style, such vigour and a sense of assured narrative strength, I was more than entertained. The film doesn’t try to be more than what it is, Thomas Jane’s performance is one I’ll remember for a long time, and as the unravelling of the central characters’ life and mind takes root in the early stages, 1922 is a film you should find within several year-end top 10 lists. A strong contender for one of the year’s better horror movies, 1922 is exquisitely executed and deserves consideration in the upper echelon’s of Stephen King’s pantheon of works.